MY goodness me!! My job is the best! I met with Jules and Toby at a gorgeous little eatery in Norwich; William & Florence. Anyway, we had a good chat and we had finished initial plans for the BIG DAY! The big day? 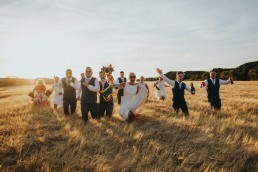 A stunning Sussex Barn Wedding on the North Norfolk Coast. The day started with big blue skies and that didn’t change all day. Hottest day of the year so far! I met Jules in Thornham, a tiny coastal village a few miles from the Barns. The gang was there and included bridesmaids, mum and hair stylist. Hair was done by the fab Flamingo Amy. After lots of laughter with the girls, I headed off to see the boys and had a good catch up with Toby. I arrived with a gift for Toby from Jules and once he was ready, he got to open it. I love really thoughtful gifts on a wedding morning, gets the emotions flowing! Toby’s best men and I were doing our level best to keep the nerves in check. Not sure any of us helped really. Jules arrived in an awesome 60’s Snipe and the ceremony took place. Bathed in early afternoon light, Jules and Toby made their vows to a crowd of their nearest and dearest. Afterwards, I took J+T off to the beach with some Champagne with a quick stop at the ‘Best view in Norfolk’* A little run through the fields to get the pulses racing and then back to Sussex Barns for some of the best wedding food I’ve had. Jules and Toby danced into the night, with friends and family partying alongside them. A beautiful day with beautiful people. *In my very humble ginger opinion. Check out what Jules and Toby had to say about their amazing day over at Whimsical Wonderland Weddings. It’s a beaut of a read! Click here for more!